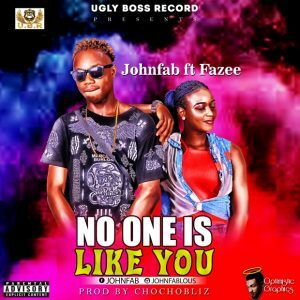 Johnfab comes through to serve us with a brand new song titled “No One Is Like You” Featuring the female singer Fazee. after The successful event Ugly Boss Fiesta 1.0, Johnfab has gotten a massive response as a king of the street rap monster. This masterpiece “No One Is Like You” is a sweet melodious song that enhanced more pride in a woman.